Christmas has come and gone, my guest has left, and all that is left is the memories. Our Christmas meal was an organic rib-eye steak that I purchased from Whole Foods. It was a bit on the expensive side, but I almost never cook and eat steak, so I figured it was worth it. 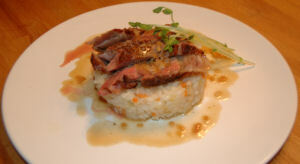 I decided to prepare the steak two different ways; an Asian inspired dish and an Italian styled dish. The Italian dish was served on a bed of vegetable risotto, pea greens, and a white wine beurre blanc. 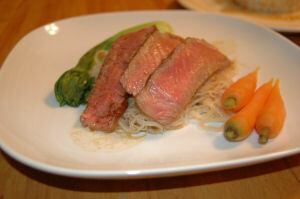 The Asian dish was served with steamed bok choi and baby carrots served over a bed of rice noodles and topped off with a sake/teriyaki reduction. While it was a little strange, we had two plates for dinner. We decided it was ok since it was Christmas.